Flanking the north side of the Erie Airpark runway, the house resides on a three-acre site offering unobstructed views of the Rocky Mountains. The lot is so close to the landing strip, that 2/3rds of the property is un-buildable due to air right restrictions enforced by the FAA. These restrictions, although invisible, weighed heavily on the resulting architectural form of the residence. 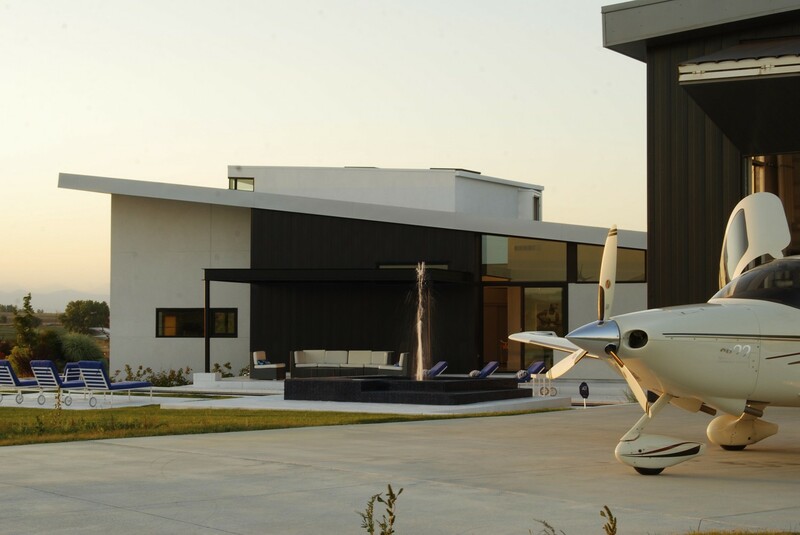 The client for this residence is a spinal surgeon who recently acquired her pilot’s license. This led to two conceptual drivers for the architectural form of the residence. First, the program was overtly organized along a spine, or armature, which literally separates/connects the hangar to/from the house. Second, the notion of ‘controlled risk’ became the criteria for determining volume, materials, connections, voids, circulation patterns, and views.